If you’ve ever tried to coax a headstrong child into brushing before the morning school bus shows up, you know what a challenge it can be to make sure their teeth stay healthy. Not every child understands or accepts the importance of good dental hygiene, and working parents can’t stand over their shoulders every single minute. But beyond brushing, our staff at Merion Village Dental offers a safe and effective method to help protect your kids’ teeth – dental sealants. Sealants are easy to put in place and provide a powerful first line of defense against dental decay and cavities. Dental sealants are made up of clear or white polymer material that is painted onto the chewing surfaces of your child’s molars. This material covers and seals the pits, fissures, and surface irregularities where bacteria becomes trapped and develops. The dried sealant forms an invisible, physical barrier between teeth and food particles. If cared for, dental sealants can last a long time. Your dentist will check them regularly for wearing or chipping, and can easily repair them with more sealant. Placing sealants is a relatively short procedure. Your dentist first cleans and dries the child’s teeth thoroughly, and places an absorbing material (like cotton) around them to absorb saliva during application. A bonding agent is then put on the teeth, to give the sealant a better grip on the surfaces. After the teeth are rinsed again, the sealant is painted on the areas. Some sealants are cured with a special light treatment to make them harden faster. According to Timothy Wright, DDS, the lead author of the study, children with sealants are 80 percent less likely to develop cavities than those without sealants. And along with preventing new cavities from forming, sealants halt existing decay from becoming worse. 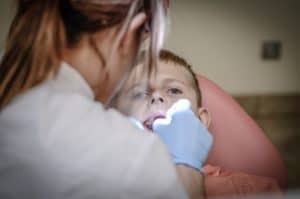 Even if your child is a good brusher, it can be difficult for him or her to do a good job with back teeth – even with the right size brush, little mouths can be hard to scrub properly. Sealants protect those molars from food particles, providing a strong first line of defense. Some parents may also have heard concerns about exposure to BPA (a resin used in plastics) from sealants. But according to the ADA, the amount of BPA patients are exposed to by getting sealants is less than the amount a person receives from the act of breathing. More information on the misconception can be found here. Dental sealants are a great way to give your kids a strong start toward good dental health. And if your child is nervous about going to the dentist, we’re happy to show them around the office and help them get comfortable first. To schedule, call us at 614-443-4400, or request one here.